Link is broken for me on mobile. Also, the google machine didn’t return any 2018 results with title similarity. 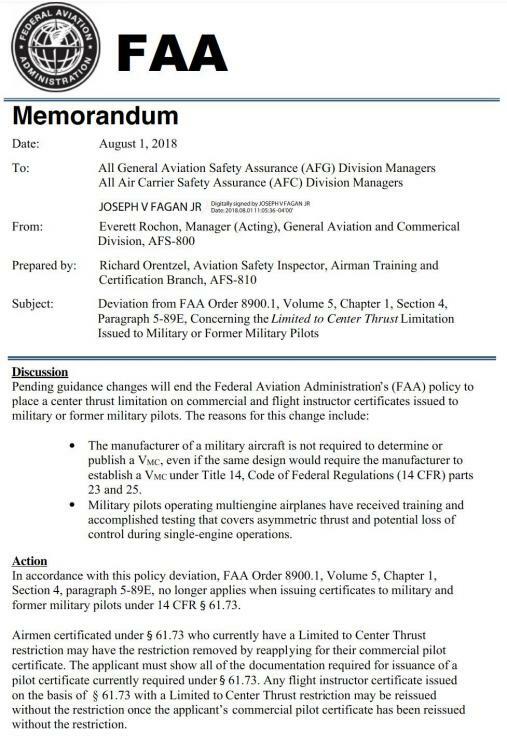 So, as a former T-38 instructor I can get the centerline thing removed with just a little paperwork? Yup. And take a mil comp written test (that is orders of magnitude easier than the Atp written) and get MEI/CFII. Easy application points. I then joined the AF and instructed in 2 engine fighters for a bit. I've also recently got the ATP knocked out. What's required to add the MEI to my ratings? Is it still the mil comp written test as mentioned above, or not since the CFII is already on my cert? I assume it's one more container to check on apps? Talk to Sheppard air, but I think you have to take the mil comp test once. After that, just add on with form 8s at the fsdo office. Btw, the milcomp cfi test is orders of magnitude easier than the atp written. I'll second what Hoss stated. Sheppard Air are very helpful. The mil comp CFI written is a piece of cake with Sheppard Air's study software. I was a CFII with the ME-only in a prior life too. I simply had to go down to the FSDO with my C-17 IP forms 8 and it took all of 10 minutes to get the temp Instructor certificate with the ME add-on. No mil comp test required. I plan to renew that way this fall as well. Not sure if that's works with a fighter, but I would think with the new CL thrust guidance, you should be able to do the same and avoid the test. Give the FSDO a call. It's hit or miss, but they are generally pretty good about helping out mil guys and answering those types of questions. The guys at the Herndon, VA office are great. Anyone been successful with this? Got my multi engine mil comp about a year ago, before the memo. Last post has some details. I got the restriction removed a couple weeks ago. Just walked into the FSDO and filled out a couple forms.